The Mission and its activities are the vision of Brig. Partap Singh Ji Jaspal (Retd. ), a direct, intimate and lifelong disciple of the Greatest Sikh Saint of all times, Baba Nand Singh Ji Maharaj. He had the most blessed privilege of having Direct Darshans of Baba Nand Singh Ji Maharaj, of sitting in His congregations and to have been initiated on this path by Baba Nand Singh Ji Maharaj Himself. Proud son of Baba Narinder Singh Ji, who was himself Babaji's most Beloved Disciple, Brig. Partap Singh Ji Jaspal was also blessed by his father the service and worship of the same Divine body of Sri Guru Granth Sahib which Baba Narinder Singh Ji had unceasingly served and worshipped in his life-time and from which he had realised Lord of his love Baba Nand Singh Ji Maharaj and the Supreme Divinity Sri Guru Nanak Sahib in flesh and blood. Brig. 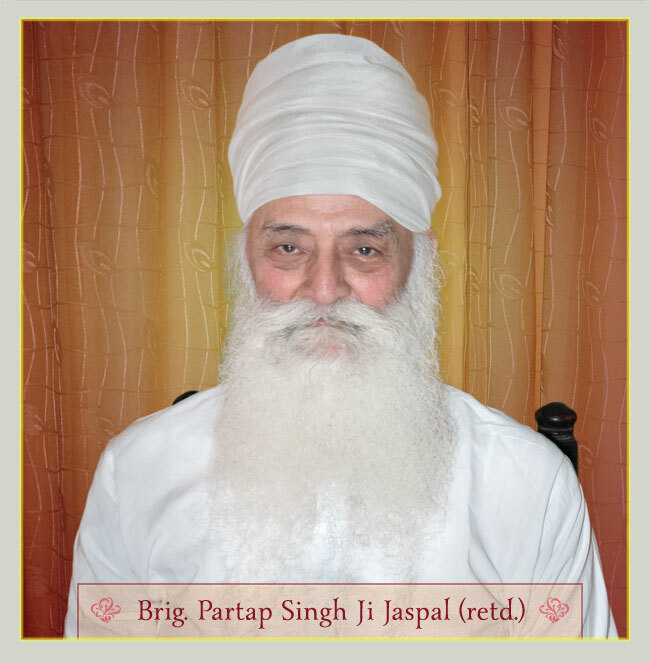 Partap Singh Ji Jaspal has only one ambition, that to share with the world, the priceless spiritual treasure that he inherited from Baba Nand Singh Ji Maharaj and his own worshipful father, Baba Narinder Singh Ji. He has been devoting his entire time, energy and effort unceasingly for this cause. www.Baisakhi1999.org - Tribute to Guru Gobind Singh Ji and The Khalsa established on Tercentenary as the Most Befitting Tribute on This Sacred Day of the Khalsa. www.Baisakhi.org - This website was later set up to further spread the Message of Baisakhi, and to add other valuable internet services. www.Tercentenary2008.org - Website setup to pay our humble Tributes to The Eternal Guru Sri Guru Granth Sahib on the Most sacred Tercentenary GurGaddi Diwas, being celebrated as “300 Saal Guru De Naal”. The Holy Presentations are also shown on the reputed Religious/Punjabi TV Channels, Cable Networks in India and are available through Books, Audio and Video Cassettes. Everything Baba Nand Singh Ji Maharaj preached was marked with Purity and total non-involvement of any worldliness. It is only at His Lotus Feet that we tasted the True Bliss of the House of Lord Guru Nanak. Fully aware of our limitations, we aspire to retain the same purity and non-wordliness in all our presentations and works here. You would feel as you go through the text, audio and video a distinct, undiluted bliss and fragrance of the Glorious House of Guru Nanak retained in its pure, original form. With the grace of Lord Guru Nanak, the Mission has spread beyond all our expectations. Thousands of emails and blessings that we have received from all over the world and continue to receive every day are our most treasured possessions today and our more than deserving rewards. Our websites have also won numerous rewards and reviews including "Best of the Net" from About.com, Editor's choice award from Snap.com, Netscape.com, reviews from Indiatimes.com. www.BabaNandSinghSahib.org has won the world's top-rated and also the highest level (level 5+, considered best of the best) award - the Webpix award from Beehive. Soon afterwards, Brig. Partap Singh Ji's Labor of Love, www.BabaNandSinghSahib.org was released. It immediately captured the imagination of millions and won them over with an precedented Divine Saga and rare Divine Wisdom. At the turn of Millennium, the website www.SriGuruGranthSahib.org was presented to the world as the Parting Divine Gift of the Millenium. It unfolds Sikhism in its untainted form, as it was preached by Sikh Gurus themselves by their own Glorious Life Samples. We have been concentrating most of our effort now on Video and Audio. This is the media most appealing to the audience and the most effective as well. The evolution of www.SikhVideos.org is a result of this long dedicated effort to present in the form of Videos the entire Life History and Teachings of our Beloved Gurus to the audience the world over. The website www.SriGuruNanakSahib.org has been dedicated as a humble Tribute to the Supreme Divinity, Sri Guru Nanak Patshah. The Mission has not accepted any donations in any form ever since its inception. Neither has it permitted anyone to obtain the same in the name of the Mission, or in the names of Baba Narinder Singh Ji, Baba Nand Singh Ji Maharaj, or the founder of the Mission, Brig. Partap Singh Ji Jaspal (retd.). This Maryada, culture is unique amongst all the known cultures established in Satyug, Treta, Dawapar and Kalyug. Mahan Babaji did not allow the Maya in any form to enter His Holy Place. There has not been a single instance in all the ages, of such a place where sadhus, sanyasis, had not gone for collecting, begging for food or food items from the people or their houses. Surprisingly in the midst of Kali age, Baba Nand Singh Ji Maharaj established a holy place which, in all aspects, was totally devoid of any influence of any form of Maya. 5:30 pm to 6:00 pm Evening (Eastern Time). 5:30 am to 6:00 am Morning (Indian Standard Time). Apart from the dominant presence on internet, the spiritual renditions of Guru Nanak Data Baksh Lai Mission are broadcast through the Satellite and Cable Network, they are available as Video and Audio cassettes, and also made available through publications. We are going to launch the productions of Guru Nanak Data Baksh Lai Mission in a big way into the Satellite world, the proceedings for which are underway. All of our Video and Audio programmes have been prepared taking exceptional care of the quality and standards, with a particular emphasis on using the digital technology to the maximum extent. They are comparable, if not better than any of those available from big video production houses. Some of our Video and Audio productions have been released through T-Series and are available through distribution channels of T-Series. We have also made our Video programmes available in the form of VCDs to facilitate spreading the Message to people away from the home land. Today by accident I saw a clip of your video showing at the temple. I came home and saw as many as 5 to 6. I can tell you now that this is a Masterpiece comparable to none other. I do not think that there is any other production that can match the creation of these videos. This is absolutely fantastic and marvellous and a Sewa comparable to none other, of course sitting down in meditation prayers is the highest sewa as it is difficult to sit and meditate in the name of GOD. But this is a Great Spiritual Treasure here and only needs Love to understand and shed tears along with it. There are many perceptions of a person's mind when he views your video production and the melodious singing of your Group of sisters and brothers and the music. But one will need to have Utmost LOVE to appreciate its deep meanings and enjoyment and bliss. Dhan, Dhan, Dhan, Dhan and Dhan is His Holiness Baba Partap Singh and his family members and group of associates who are making this possible and keeping it updated. Great are you Baba Partap Ji Sahib. Don't worry if a few don't appreciate your works. It is fantastic. I only wish I was with you not as a worker or sevadar but just as a Listener. I pray God gives you Baba Budhha Singh Ji's healthy and long life span. I wish to come over to meet your holiness and sit around with you and the kirtan group. Hope this can be possible. I make a humble request that you ask your kirtan group to sing out the whole Sri Sukh Mani Sahib Bani. They all have good voice, and cooperation. Make this possible even though it has to run into 4 to 5 videos. Also the Mohala 9th. Great people are few and looks like few will come in the future. Please educate someone else from now on another Lover of GOD who will carry on the work of His Holiness Baba Partap Singh. The immense LOVE that Baba Partap Ji has can be seen. He indeed is his Holiness. Sat Shri Akal and I will keep in touch. I now know where to find your kirtans. I am not so good at internetting. My name is <name left out on request>; I've been on the path to finding god since the age of 4. I've had 2 Darshans in my life of 22yrs of Guru Nanak Dev Ji, like all my other Darshans or visions they happen after I finish my Naam Jaap after 1a.m. every morning while sleeping, laying on my right-side. I've climbed my Ru up several Khands but I haven't achieved the final darshan of Sach Khand to achieve Vidiya as I wait outside the city's gates. Listening to the commentary of your videos, I feel like I'm already there, I've met many Sants but I would never tell them of my life experiences. But I am strongly compelled and eager to be educated by the Baba Partap Singh Ji Jaspal. I strongly believe I will never achieve the final darshan on my own accord, but via the grace of the true guru. ... I await for your reply, please don't ignore this email, I am willing to travel across the world at the instance of Baba Ji's Hukam. I am eager to be educated by him because intense vibration is coming off Ru/ Soul at the sound of his voice. And my third eye (chakra between the eye brows) is in focus, ready to take my soul out of my body... to sit in Samadhi. mere te kirpa karo ji. Nach meiner Meinung,es gibt keiner andere Website im Internet, wo so ein wunderschön spirtuel Musik gibt. Danke schön für so ein Website im Internet. Das ist super für so ein Musik. In my opinion, there is no other site on the Internet, where such a beautiful spirtual music exists. Thank you for such a site on Internet. That is so great for music. My name is Steven and I have a deep desire to enter the Beautiful and loving faith of Sikhism. What are the steps in Becoming a Sikh. Right now I am a Jew. I have a deep love and respect for The Sikh Faith and its love for Humanity. I am ready to do what it takes. Please help me become a Sikh as I would like to enter the loving non-judgemental arms of Sikhism. I beg you please help me convert. Please write back. I teach Religious Education at a school in England. I would be very greatful if you could send me videos on Sikhism that I could use with students. These would be gratefully received and help children to understand and respect the great Sikh tradition. It is a privilege to read your site. Your father's story is a blazing example for every devotee. Please consider revealing the depth of Guru Angad's Guru laya to set an example for insincere disciples such as myself. By the grace of my own Baba, Lord Anandmurtiji, I offer you my deepest Namaskar in Him. Hi my name is Jimmy Alite. I'm on a very intense path to find God. I want to fall in love with God so badly. I have a couple of questions please. Your web site and writing is so beautiful. I'm searching for a teacher and a path. Is there anyway I can be initiated in this path of God realization? Do you ever come to the USA? I am writing to you from Australia. Firstly may I say a big thank you to you for such a beautiful website. It is a gift to the world. materials were also in English. I am finding that I love the Sikh religion and dearly want to embrace it with my full heart. “Yug Yug Satgur Dhare Avtaree”. May God bless you and thank you. I would first of all like to thank S. Partap Singh Ji for his bold step towards preaching Sikh religion in today’s world when even most of preachers are doing preaching as their profession for income. I joined this site as I was searching for free shabads. When I logged onto your site, it was hard to believe that such a preacher is also there. I always used to search for free shabads (audio as well as video), I got several sites but I swear that since I Some Fe edbacks Re ce ived for Website s have logged onto your site I do not search for shabads anymore. When I was in search of shabads, and I didn’t find shabads, I made up my mind that I will make a step for free shabads for preaching, but when I found your site I found that my dream has come true before I did anything for it.